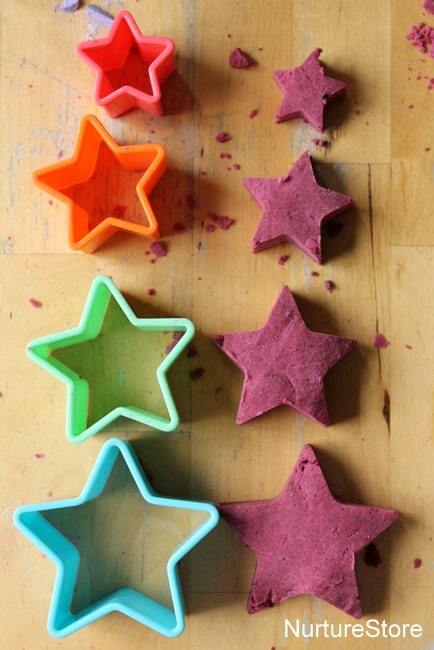 This colourful homemade cloud dough recipe uses just three ingredients and is great for sensory play and some hands-on math activities. 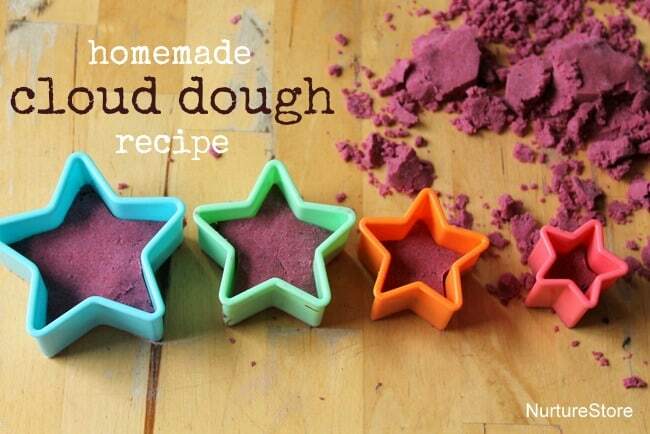 To make this cloud dough recipe you’ll need four measures of plain (all purpose) flour to one measure of oil. You can use baby oil if you would like the fragrance, but a vegetable oil is a good choice if you have young children playing, who might be tempted to have a little taste. I used four teacups of flour and one teacup of oil to produce a big bowl of the cloud dough. 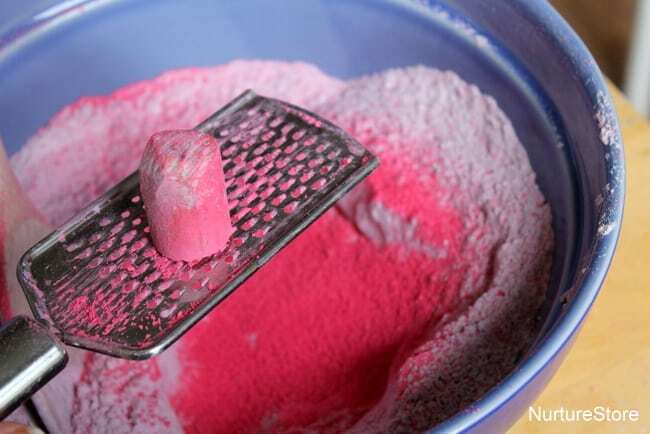 To add the gorgeous colour, simply grate in some chalk. 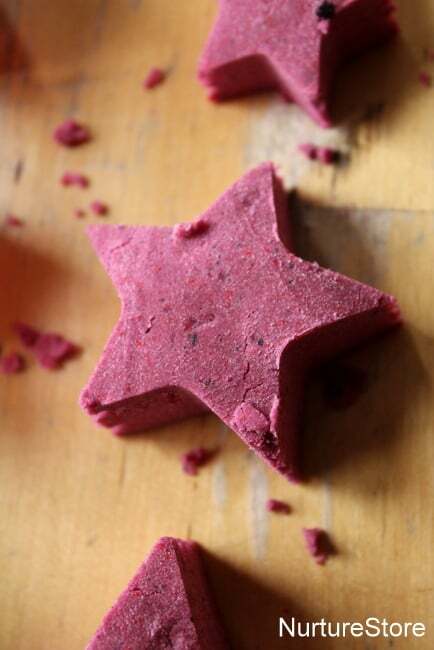 I used two chunky sticks of chalk, one pink and one blue, to get this lovely berry colour. You could use power paint in place of the chalk. 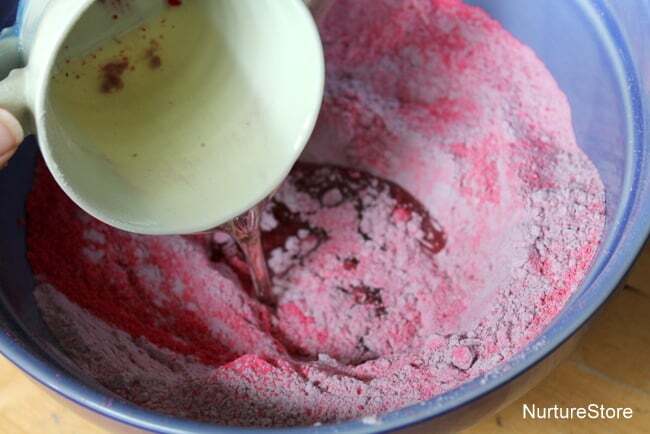 Place your flour and chalk in your bowl, and then pour in the oil. You can add a drop of peppermint essence or an essential oil if you wish. 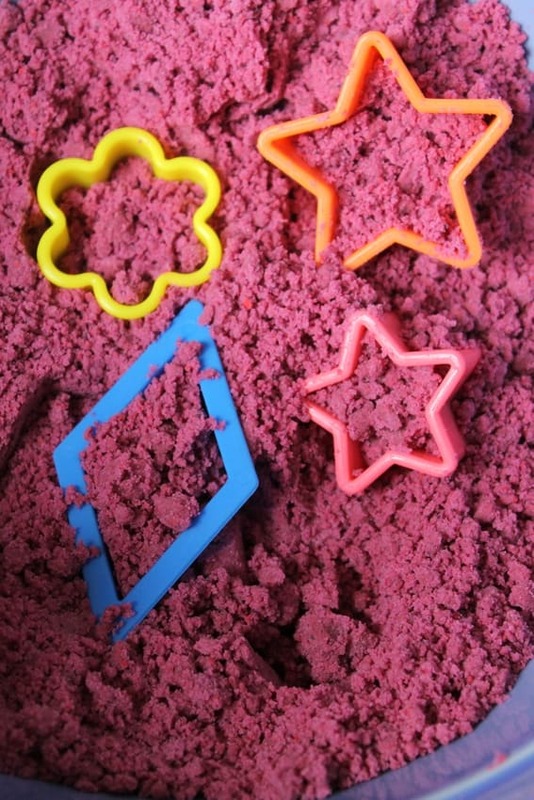 I like to ask the children to help me make all our play doughs and sensory play recipes as each mixture is a table-top math and science lesson in itself, as you count and measure the ingredients and then observe the change in textures as the materials combine. Then stir, stir, stir until all the ingredients combine and your cloud dough forms. The texture is a like pastry. It will hold together is you squish it in your hand, but then crumble again if you rub it. 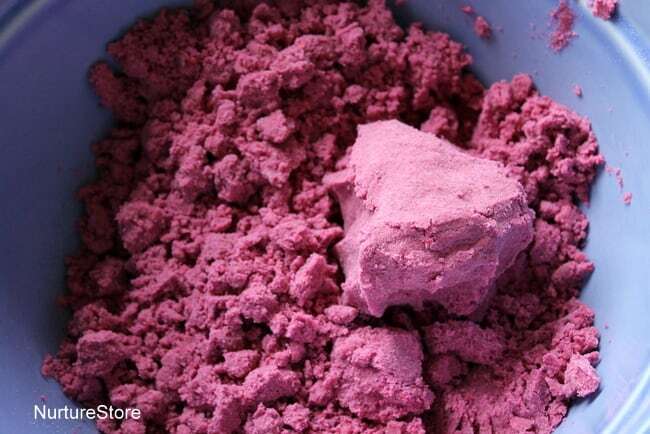 It’s an interesting contrast if your children are used to playing with sand or play dough. 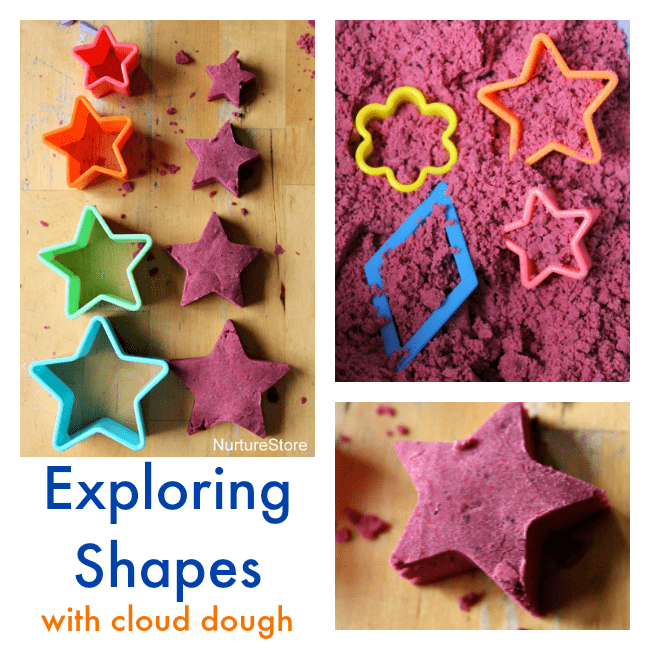 The cloud dough combines well with cookie cutters, and providing some in different shapes and sizes invites some math exploration. With young children, you don’t need to specifically teach math in this play invitation, just allow them to explore for themselves. As they cut the ‘cakes’ and move the cookie cutters around they are encountering the dimensions, angles and alignment of the shapes. 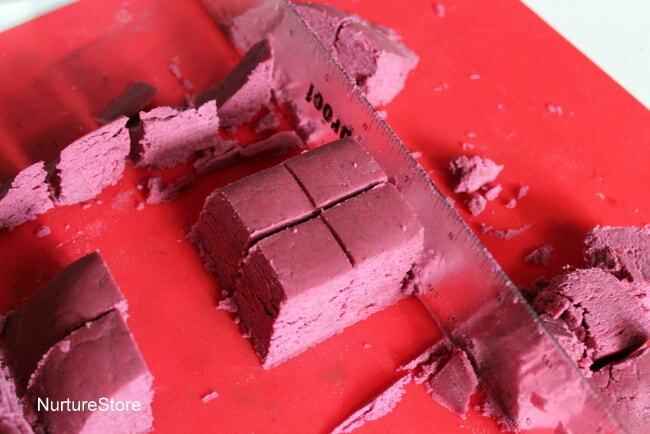 We like to stamp out a shape and then also notice the negative shape left behind when the cloud dough is removed. Run your finger around inside the cookie cutter to feel the sides and angles. 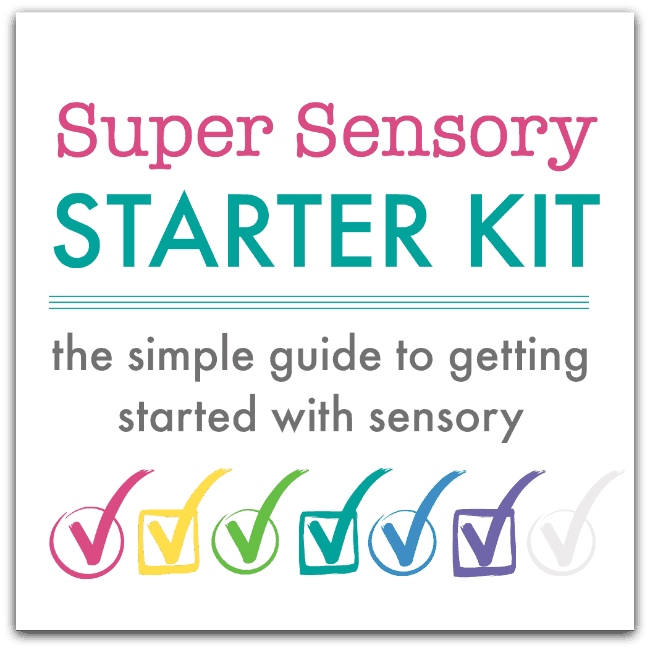 You can play alongside and chat to gently introduce mathematical vocabulary. :: talk about which is bigger and smaller. A set of cookie cutters in increasing sizes is great for comparing size, and you could line up your cloud dough shapes from big to small. My daughter always likes to give the big ‘cake’ to Daddy and the smallest one to herself. 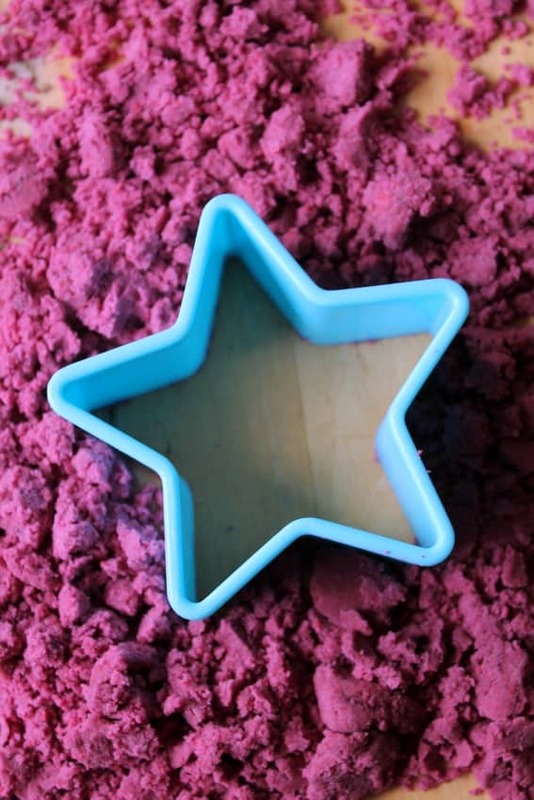 You could also hide your cookie cutter shapes inside your cloud dough, and then enjoy the sensory exploration of hunting them out. Close your eyes and see if you can feel which shapes is which, without taking a look. My elder daughter likes to borrow in some of our math equipment, such as this ruler, to work on making perfect squares, measuring all the sides and using the ruler to try to chop the square in half right through the middle. 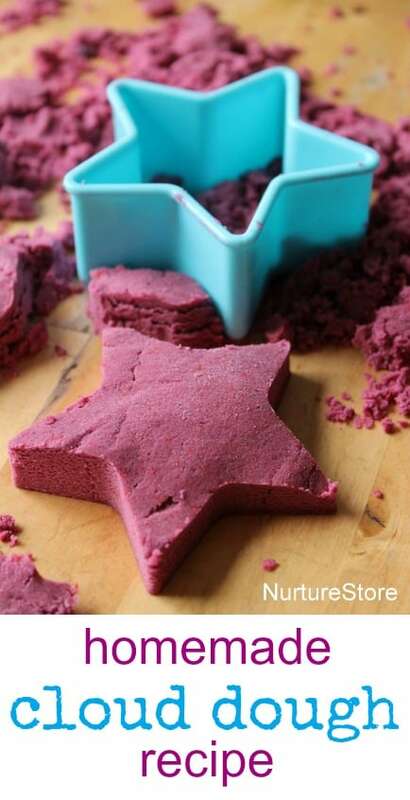 The cloud dough is the perfect texture to hold the shapes she creates, and then is easy to crumble when she wants to make some more. Yes, so simple, but it works really well. Hope you have a fun day off! 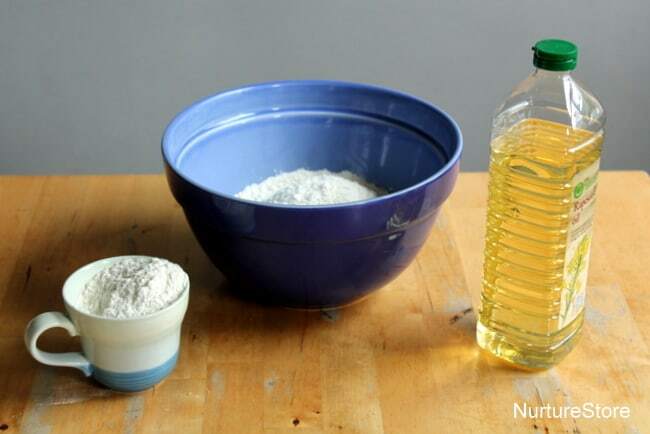 Hi Valerie, this recipe is four flour to one oil. I’ve seen other recipes that only use a half oil, but I prefer this version. As you say, it does hold it’s shape well. I store ours in a mason jar, or in a tightly-tied plastic food bag. how long can it stay stored? forever? that would be great! thats fine saw your answer to another question. thats great!! Hi Emma – well, ages! Make sure it doesn’t get wet. I store mine in a glass jar with a tight lid and it lasts for months and months. Will this work with canola oil? I have never used canola oil Vincenza but I would guess that yes, it would work. If you try it, let me know how it turns out. Hi, my kids and I just did this cloud sand and they love it!! How long do you think we can store for? Hi Matty. Great to hear they had fun. I keep ours in a glass jar with a air-tight lid and it last for months and months. I bet it smelled fantastic Jillian!